This week I opted for another Barry M sunset nail polish in the form of Empire State of mint which is of a mint green shade. I am slowly but surely making my way through all the colourful polishes in my collection before summer is over and I am exiled to to the dark shades. I know I have said this previously but I really am loving the sunset polish range from Barry M. I really do love the glossy finish it gives my nails which is why I find myself going back for another polish from the range week after week. Oh and let's not forget that a base coat is not required when using the sunset polishes thus speeding up my nail painting process which is always a plus in my books. It is quite simple to achieve the finish in the images above. 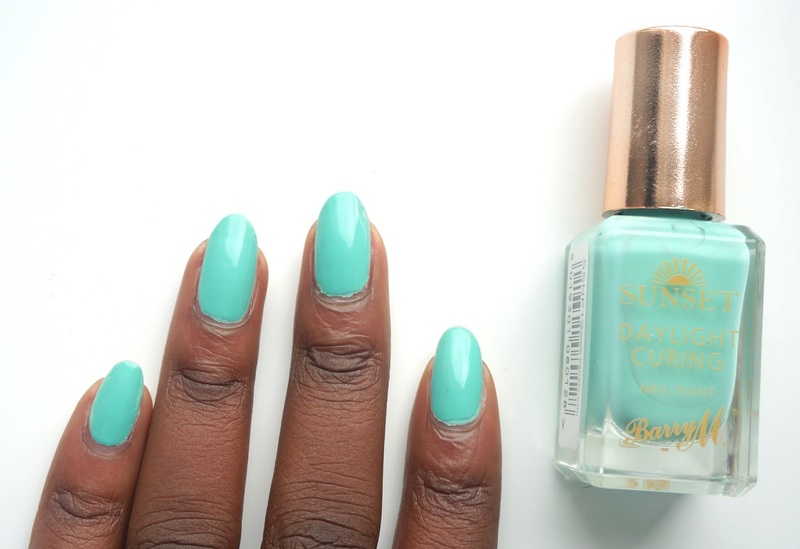 All you have to do is apply two coats of Barry M's Empire state of mint and then finish off with the sunset top coat. It is advised that you use the sunset topcoat as it was made specifically for the sunset nail polish range to not only add an extra glossy finish but o tenable your nail polish cure in the daylight. Any thoughts on this colour?